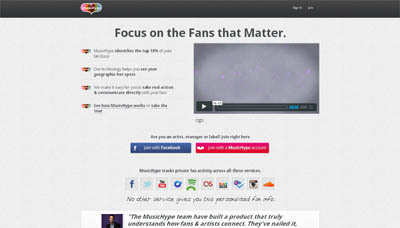 MusicHype is a social CRM that helps artists, management companies, labels & digital agencies focus on the fans that matter. MusicHype gives users the ability to identify, geo-target & communicate directly with the top 10% of fans, who make up almost 50% of the total artist spend. Every fan counts, but some count more than others. Super-serve & super-satisfy the fans that matter. * We believe the days of “Tweet this to win” are over. * We believe the power of technology should connect people. * We believe music fans want real relationships with the artists they love. * That’s why we built MusicHype. MusicHype gives platform users the ability to identify, geo-target & communicate directly with the top 10% of fans. These fans make up almost 50% of the total artist spend, so they’re worth the effort. Our platform saves users time and allows them to really focus on the fans who want to be talked to & appreciated. Think of it as email marketing 2.0 where you capture a fans complete digital footprint & see exactly how they love a band over Twitter, Instagram, LastFM, Spotify, Rdio, YouTube & more. Based in New York, NY, our technology has been used by artists like Ke$ha, Thievery Corporation & OK Go to help them identify their top fans. With over 15,000 fans hooking in we know how fans want to communicate with the artists they love. Every fan counts, but some count more than others. Super-serve & super-satisfy the fans that matter with our free plan. Get going! MusicHype goes beyond aggregated data provided by companies like Music Metric and Next Big Sound. MusicHype displays private fan data with actionable intelligence, so our clients can use tools to take action and communicate directly with fans. No other platform offers a distilled view of important fans, recommends actions and facilitates the steps to monetize.